The designs of John Corby are a fascinating area of study in many ways, as is the man himself writes W M Nixon. His father invented the eponymous trouser-press which saved so many of us from looking scruffy when we were on business trips relying on properly-equipped hotels to freshen up the trews as one day followed another, and the crisp look with which the tour had started was disappearing in a grubby wave of trousers creased every which way except the right one. Young John could well have followed into a profitable empire of handy gadget invention, but maybe there’s room in England for only one James Dyson…..Whatever, racing yacht design has been John Corby’s passion from a very early age, and some extremely successful front-rank owners – Peter Wilson, Roy Dickson and Anthony O’Leary of Ireland being notable among them – have been more than ready to go along with his enthusiasm for what some people deride as narrow wedge-shaped boats carrying an awful lot of keel ballast in extreme torpedo-shaped bulbs of lead. For others, there was and is only one boat worth racing, and that’s a Corby, although so far none of them has yet taken up my suggestion that a suitable name for a Corby would be Hosenbugler. It has a certain ring to it, even if it is no more than the German for trouser-press, as we’ve discovered from reading the label while getting the press-setting just right in some distant hotel room. So maybe if you go after this Corby 25 in North Wales and feel the need to give her a new name, you’ll find some attraction in that moniker. But be warned. This is not a forgiving boat. The problem with a Corby is that she’s a boat for real experts. There’s not even a wafer-thin margin for error between doing what’s needed to get a winning performance, and putting on a show which has you in the crab grass. Yet when everything’s in tune, a Corby really sings as she buzzes along, giving a very hard time to boats twice her size. 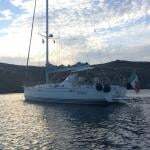 Although this Corby 25 for sale on Afloat.ie boats for sale is 2010-built, she’s as good as new. Her history is interesting. Will Partington of Partington Marine in Pwllheli in North Wales, a keen racer when he could get the time, had been thinking Corby for a while. He got to hear that the Corby 25 moulds in Latvia – where most of the boats had been built – might be for sale. He got hold of those moulds, and built what may well be the most closely-monitored Corby 25 ever constructed, with everything possible done to optimise weight distribution. The results were more than encouraging, with success recorded on both sides of the Irish Sea. But with Pwllheli developing rapidly as a sailing centre, the demands of his business were such that Will simply didn’t have the time to campaign the boat nearly as often and as totally as he would have wished, so now he’s looking for a new owner who can do the job properly. The Corby 25 is of particular interest to time-starved Irish owners, as she’s conveniently trailerable, and once you’ve previously had the rig set up in optimum tune, it takes only a couple of hours to rig her again when you’ve handily trailed to some new regatta. Yet as she’s IRC offshore compliant, this year’s big logistics challenge of doing the ICRA Nationals in Crosshaven from June 9th to 11th or the Sovereign's Cup from June 21st. 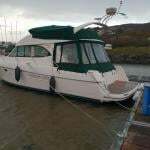 Where to Moor a House Boat on the Irish Coast?